THE BLACK BOX, downtown Franklin’s theater, music, and event venue, presents a Big Band Brunch with the renowned Kenny Hadley Big Band on Sunday, November 13. The critically-acclaimed 16-piece ensemble, led by drummer Kenny Hadley, boasts masterful musicians with performance ties to Big Band legends Woody Herman, Count Basie, Stan Kenton, Maynard Ferguson, Buddy Rich and more. 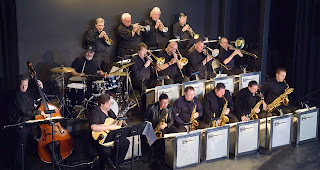 The Kenny Hadley Big Band has shared the stage with such notables as the Count Basie Orchestra and the Duke Ellington Orchestra and has hosted guest soloists including Clark Terry and Louie Bellson. Combination tickets for brunch and music are $45; tickets for the concert alone are $20. THE BLACK BOX, home of the Franklin Performing Arts Company (FPAC), is located at 15 West Central Street in downtown Franklin. Brunch begins at 11:30 a.m., with music beginning at noon. For tickets and more information, visit www.THEBLACKBOXonline.com or call (508) 528-3370.